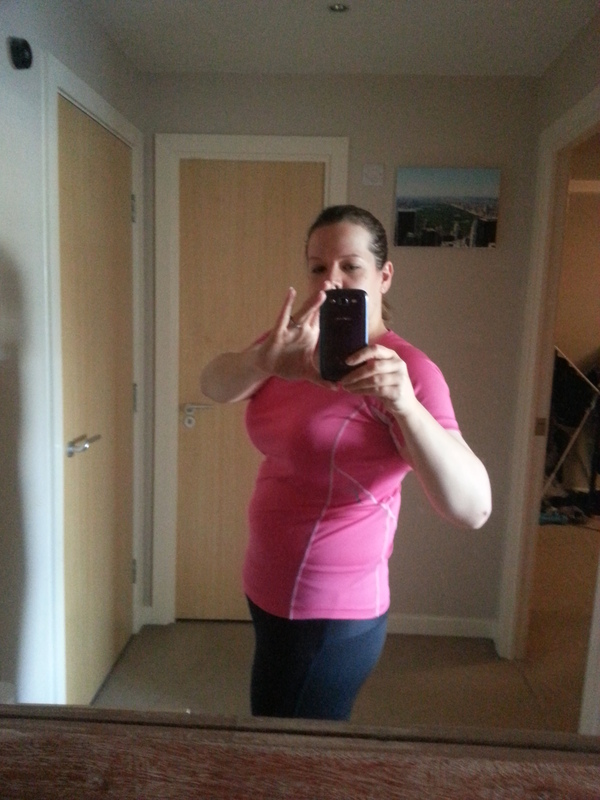 Julia Buckley’s Fat Loss Fitness Programme – week 8 and Phase II done! I’m now two thirds of the way through Julia’s programme – the time has flown. Last week was the final week of Phase II and was also my last week as a lady of leisure before starting my new job yesterday. Julia’s advice to us was to make sure that we gave the Phase II workouts our all but to balance that with some extra rest if we needed it to prepare our bodies for the challenges of Phase III. I ended up with a head cold towards the end of the week so took some extra rest to make sure that I was fully recovered for the challenges that lie ahead in the final four weeks of the programme. Not that I dipped out of any of the workouts – I still upped my weights and pushed as hard as I could. But on days when rest was an option I took it. Diet wise, I certainly feel that my new way of eating is becoming more and more of a way of life for me. 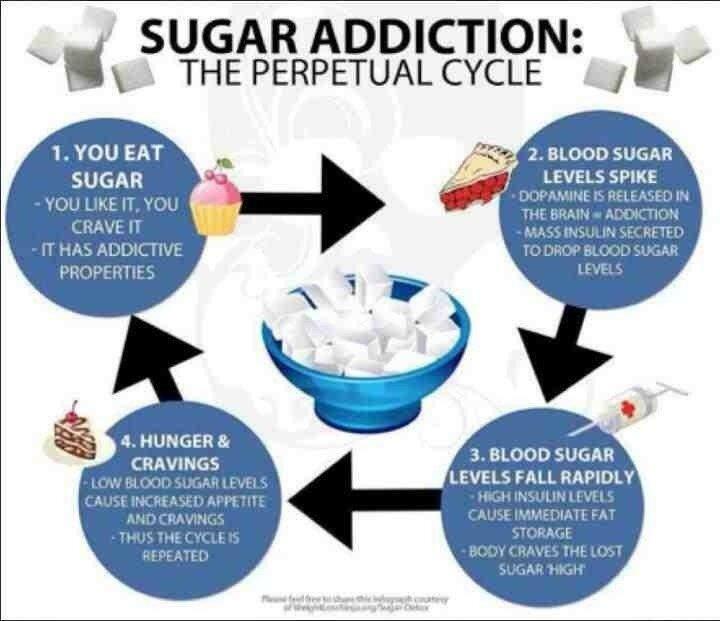 I am understanding more about how certain foods (sugar and refined carbs in particular) make me feel and realising that I feel better without them in my life. I have no intention of letting them back into my diet in any great quantity once these 12 weeks are over. I’ve realised how much they were driving my energy levels and appetite in a horribly vicious circle. This graphic was shared in Julia’s Facebook Group this week and I can really relate to it now. Results wise everything keeps moving in the right direction, and at quite a pace. I had a brilliant morning of shopping last week when I not only bought new bras in the smallest back size I have ever been, but also fitted into my first ever item of size 10 clothing. OK, it’s a big size 10 in a stretchy fabric but I don’t care – it’s a size 10!! According to my body fat analyser scales I have now lost 6.6% of my body fat, and over a stone in actual body fat. As I’ve also gained lean body mass my total weight is only down by 6lbs but frankly I’m not very interested in that stat anyway. I am feeling fantastic and starting to get comments from people about how good I’m looking which is just lovely. There are now only 4 short weeks left of this programme. Being back at work presents me with new challenges but I am absolutely committed to giving this my all and seeing just exactly what I can achieve in these last 4 weeks. Bring on Phase III. 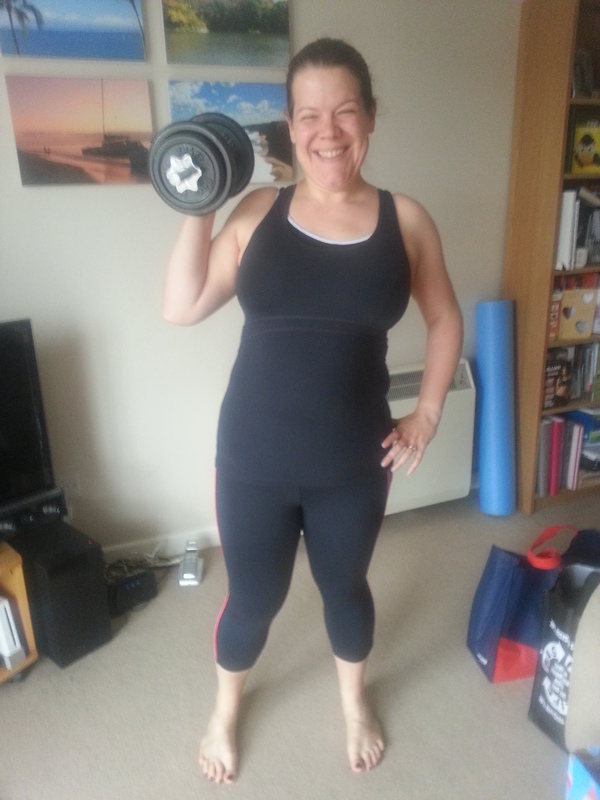 Oh, and a couple of people have asked for some photos – here’s a couple of me ready to go out for a run and with my new best friends – my dumbbells! Next Julia Buckley’s Fat Loss Fitness Programme – week 9 done!